The U.S. and China market for asthma and chronic obstructive pulmonary disease (COPD) drugs is expected to exhibit growth at a steady pace in the next few years. Factors such as a significant rise prevalence of COPD and asthma in these two countries, advancements in diagnostic methods, and rising awareness among patients regarding the available treatment methods are considered key to the overall growth of the market over the period 2016–2024. The market is expected to exhibit growth at a moderate pace in the first few years of the forecast period, chiefly owing to the patent expiries of leading drugs and the subsequent price erosion. However, the market is expected to witness new drug candidates by 2020, which will help the market tread along a better growth path in the forthcoming years. Transparency Market Research estimates that the market will exhibit a 4.1% CAGR from 2016 through 2024, rising to a valuation of US$18.7 bn by 2024 from US$13.0 bn in 2015. On the basis of drug classes in the U.S. and China asthma and COPD drugs market, the report examines the future scope of growth for varieties such as bronchodilators, anti-inflammatory drugs, monoclonal antibodies, and combination drugs. Of these, the segment of combination drugs is presently the leading segment. It accounted for a 54% of the U.S. and China asthma and COPD drugs market in 2015 and is expected to continue to dominate throughout the report’s forecast period. Combination drugs benefit from the recommendations from agencies such as Global Initiative for Chronic Obstructive Lung Disease (GOLD) and Global Initiative for Asthma (GINA), which regard combination drugs as the safer course of managing asthma and COPD. The segment of monoclonal antibodies is expected to emerge as a prominent drug class for the management of asthma and COPD in the next few years. Emergence of new drug candidates in this segment will bolster its growth potential in the market during the report’s forecast period. In the U.S. and China market for asthma and COPD drugs, the U.S. market clearly dominates, accounting for a more than 81% of the overall market in 2016. The key factors to have benefitted the U.S. market, despite it being a relatively smaller market in terms of population, include the high costs of asthma and COPD drugs and a high level of attentiveness paid by consumers to healthcare and wellness. The U.S. market also contributes significantly to the overall asthma and COPD drugs market through regular product launches and high investments by leading companies for R&D in the areas of combination therapies and biologics. Although China presently accounts for a relatively smaller share in the U.S. and China asthma and COPD drugs market, the country is expected to present attractive growth opportunities in the next few years. 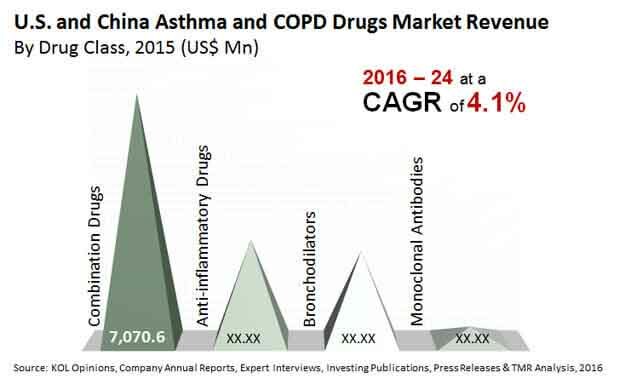 The China market for asthma and COPD drugs will exhibit an impressive 10% CAGR over the period between 2016 and 2024. The key factors attributable to this projection are the rising number of asthma patients, owing chiefly to rising levels of air pollution, and a vast array of unmet medical needs. The rising prevalence of COPD in the country is chiefly owing to the high and rising number of smokers. The China market for asthma and COPD drugs also comes across as a more attractive market than the U.S. market owing to a low level of competition and high rate of growth. Some of the leading vendors presently operating in the U.S. and China asthma and COPD drugs market profiled in the report are Boehringer Ingelheim, GlaxoSmithKline plc, Merck and Co., Inc., Novartis AG, AstraZeneca plc, and F. Hoffmann-La Roche. Asthma is a disease characterized by recurrent attacks of coughing, chest-tightening, breathlessness, and wheezing as the airways narrow and swell that vary in severity and frequency. COPD is a disease of the lungs characterized by obstruction to airflow that interferes with normal breathing. According to the WHO, COPD accounted for over 3 million deaths in 2012, which is equal to 6% of all deaths globally in that year. Moreover, the WHO predicts that COPD will become the third most common cause of death globally by 2030. However, these statistics have already materialized in the U.S. and China, where COPD is currently said to be the third leading cause of mortality. According to the Asthma and Allergy Foundation of America, asthma is the leading chronic disease in children in the U.S. It is also the most common reason for missed school days. Moreover, an estimated 10 people in the U.S. die from asthma each day, while 3,630 die each year. In China, the figures are worse. A large population of COPD patients goes underdiagnosed or misdiagnosed in China every year. A large proportion of these deaths are avoidable with proper treatment and care. Thus, the existence of an unmet medical need is clearly evident and is anticipated to augment the asthma and COPD drugs market. This report on the asthma and COPD drugs market in the U.S. and China analyzes the current and future prospects of the market. The report comprises an elaborate executive summary, including a market snapshot that provides overall information of various segments and sub-segments. The research is a combination of primary and secondary research. Detailed qualitative analysis of factors responsible for driving and restraining market growth and opportunities has been provided in the market overview section. Market revenue in terms of US$ Mn for the period between 2014 and 2024 along with the compound annual growth rate (CAGR %) from 2016 to 2024 are provided for all the segments, considering 2015 as the base year. Market related factors such as technological developments, patent expiry, recent drug approvals, investment in clinical studies and acquisitions by leading players in the market, and historical year-on-year growth have been taken into consideration while estimating the market size. Growth rates for each segment within the U.S. and China asthma and COPD drugs market have been determined after a thorough analysis of past trends, demographics, future trends, technological developments, drug development life cycle, and regulatory requirements. These factors would help the market players to take strategic decisions in order to strengthen their positions and expand their share in the asthma and COPD drugs market in the U.S and China. Based on drug class, the asthma and COPD drugs market in the U.S and China has been segmented into bronchodilators, anti-inflammatory drugs, monoclonal antibodies, and combination drugs. The bronchodilator class has been further segmented into short acting beta-2 agonists, long acting beta-2 agonists, and anti-cholinergic agents. The anti-inflammatory drug class has been further segmented into oral and inhaled corticosteroids, anti-leukotrienes, phosphodiesterase type 4 inhibitors, and others. The others segment includes mast cell stabilizers and other anti-inflammatory agents used in asthma and COPD control. Based on indication, the asthma and COPD drugs market in the U.S. and China has been segmented into asthma and COPD. According to the CDC, one in 12 people in the U.S. has asthma, and the number is rising each year. Pollution in China is among the worst in the world. This is likely to worsen asthma and COPD symptoms, consequently driving the asthma and COPD market in China during the forecast period. Geographically, the asthma and COPD market has been segmented into two countries: the U.S. and China. These countries have been further segmented by indication and drug class. The competition matrix section included in the report is likely to assist the existing players to increase their market shares and new companies to establish their presence in the asthma and COPD drugs market in the U.S. and China. The report also profiles major players in the market based on various attributes such as company overview, financial overview, SWOT analysis, key business strategies, product portfolio, and recent developments. Key companies profiled in the report include GlaxoSmithKline plc, F. Hoffmann-La Roche, AstraZeneca plc, Novartis AG, Boehringer Ingelheim, and Merck and Co., Inc.